What's the point in solving murders if we're all going to die soon, anyway? Detective Hank Palace has faced this question ever since asteroid 2011GV1 hovered into view. There's no chance left. No hope. Just six precious months until impact. 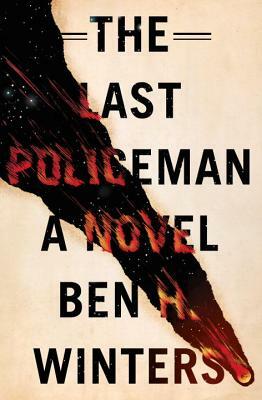 "The Last Policeman "presents a fascinating portrait of a pre-apocalyptic United States. The economy spirals downward while crops rot in the fields. Churches and synagogues are packed. People all over the world are walking off the job--but not Hank Palace. He's investigating a death by hanging in a city that sees a dozen suicides every week--except this one feels suspicious, and Palace is the only cop who cares. The first in a trilogy, "The Last Policeman "offers a mystery set on the brink of an apocalypse. As Palace's investigation plays out under the shadow of 2011GV1, we're confronted by hard questions way beyond "whodunit." "What basis does civilization rest upon? What is life worth? What would any of us""do, what would we "really "do, if our days were numbered? "New York Times "best-selling author Ben H. Winters won an Edgar Award for his debut mystery "The Last Policeman. "His YA novel "The Secret Life of Ms. Finkleman" was also nominated for an Edgar Award. He lives in Indianapolis with his wife and three children.